Cory Conacher had it made at the start of his career. Surrounded by All-Stars Steven Stamkos, Martin St. Louis and Vincent Lecavalier in Tampa Bay, Conacher was a point-producing machine. That seems a lot longer than 14 months ago. The Buffalo forward is now on his third NHL team. The offense that made him a rookie revelation and minor-league MVP has disappeared. Conacher wants to be a difference maker with the Sabres as they rebuild, but to do so he’ll have to rediscover his scoring touch and refine his competitiveness. Murray, the general manager, has to decide whether to re-sign the restricted free agent, who is due a qualifying offer of $874,125. Nolan, the coach, then needs to figure out exactly what he has in the 24-year-old Canisius College grad. It’s unreasonable to expect Conacher to replicate his early career success. He stepped into an ideal situation in Tampa Bay in 2012-13 and took advantage. In Conacher’s opening seven games, he recorded five goals and 12 points with a shooting percentage of 41.6 percent. Through the first 19 games, he had seven goals, 18 points and a shooting percentage of 20 percent. The Lightning trio of Stamkos, St. Louis and Lecavalier also figured in the scoring for 15 of Conacher’s 18 points. The winger’s pace has dropped off considerably. During Conacher’s last 107 games (16 in Tampa, 72 in Ottawa and 19 in Buffalo), he has 11 goals, 37 points and a shooting percentage of 8.3 percent. Conacher lost some of Nolan’s trust by failing to produce and heading to the penalty box. Conacher totaled three goals, three assists and 16 penalty minutes in 19 games with Buffalo after being claimed off waivers March 5. He finished the season with no points in the final eight games as his ice time dwindled as low as 6:27. The penalty minutes were troubling for the Sabres. Conacher, who is 5-foot-8 and 180 pounds, is most noticeable when playing a feisty game. He’s made a habit of drawing penalties – he ranked fifth in the NHL by drawing two penalties per 60 minutes of ice time – but his effectiveness dropped in Buffalo. During Conacher’s 35 games in Tampa Bay, he took eight penalties and drew 17. He totaled 19 penalties with Ottawa and drew 34. He had eight penalties in Buffalo and drew nine. 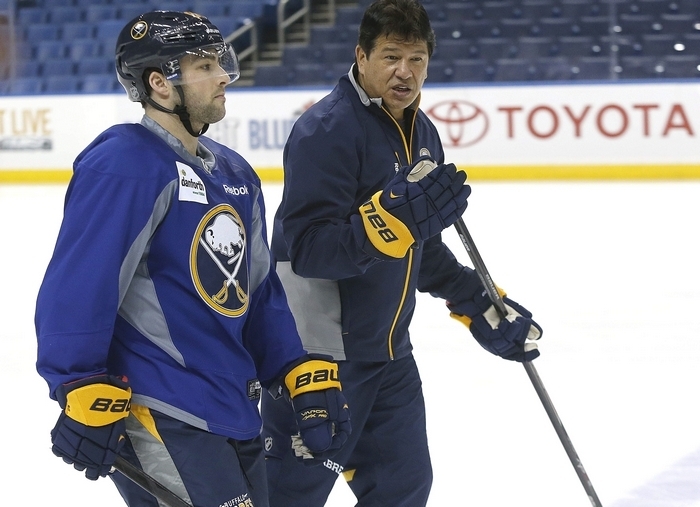 Conacher will need to retain his irritant status but hone his discipline to become a key part of the Sabres. “I want to work hard and show I can energize the team, backcheck hard, forecheck hard, do the little things that will keep me in the lineup and keep me in the game,” he said. While things weren’t perfect on the ice, the return to Buffalo was a treat for the native of Burlington, Ont.